"Ma" is a story about a Samoan grandmother trying to survive life alone. She's strong-willed and tough, but under the rock-hard exterior is an old woman trying to endure what's left of her existence. Ma is about a woman's strength, weakness, love, and humanity in a world that has almost forgotten her. Nikki has worked in the New Zealand Film and Television industry since 1995 both in front of and behind the camera. Nikki's debut short film, "Snow in Paradise," a story about a young girl in 1960s South Pacific during French nuclear testing, world premiered at the 62nd Berlinale and screened at various film festivals around the world. SIP won Best Short Film at the 2013 Festival International du Film d'Environnement (FIFE) in Paris. In 2012, Nikki was in front of the camera in kiwi thriller feature, "Housebound," and on TV3's award winning comedy series, "Super City." 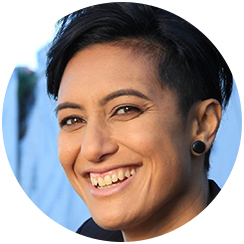 Nikki shot a documentary in Rapa Nui (Easter Island) for TVNZ's indigenous Māori language programme, "Waka Huia," which screened at the 2014 FIFO in Tahiti. It was here that Nikki won the 2014 FIFO Oceania Pitch for her own feature documentary, "Taku Ipukarea-My Homeland," about Cook Islands environmentalist Ruta June Hosking and her work in the remote island of Ma'uke. Nikki was one of ten teams from Australia, New Zealand, France, Tahiti and Rapa Nui. Nikki began filming, Taku Ipukarea-My Homeland in July 2014. Ngaire has been in the television industry for over 25 years and has a wealth of experience in production. 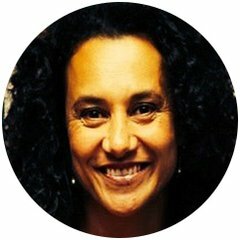 Starting in the Maori & Pacific Programmes Department at TVNZ in the late 1980s working with the late Ernie Leonard and Whai Ngata, she worked on productions from 1988 Telethon, 1990 Commonwealth Games right through to presenting on shows like Tagata Pasifika, Town and Country, NZ Living and going on to production work with Tagata Pasifika. Fuata's love for film has led her to associate produce "Snow in Paradise," a New Zealand Film Commission funded short film which world premiered at the 62nd Berlinale Film Festival. She attended the event with Writer / Director, Nikki Si'ulepa in 2012. SIP went on to win Best Short Film at the 2013 Festival International du Film d'Environnement (FIFE) in Paris. PBS: How did you recruit the actress for this film and what was it like to work with her? NIKKI SI’ULEPA: “Ma” is a story about my real life grandmother. She's not your ordinary grandmother and many of her antics and stories and life experiences are extraordinary. I auditioned her for the part, and luckily enough, she was great! To be fair, my cousin said, “She's been acting and reenacting these stories her whole life,” so it was just another day in the office for Ma, only this time it was on camera. At the time, Ma was 81 years old. We scheduled a five-day shoot. Ma was so good that it only took us four days to shoot. She was terrific! She didn't have a line of dialogue, as I thought it might confuse her. I just asked her to do a scene over and over again, so that she'd get used to it. Sure enough, that technique worked and we got it all in the can. Ma charmed the crew. I felt as though telling her story gave her a real sense of purpose, even though she may not have always known what was going on. PBS: Where did the inspiration for this story originate? PBS: There are multiples of everything that she keeps in her house. Why is this and why a focus on the monkeys? NIKKI: When Ma's kids and grandchildren moved away from the house and her husband passed away, Ma was left with a void. Her castle that she once ruled, that was full of life and heart, was empty. She was always a collector but her addiction went into overdrive when she was on her own. She started a new family of toys and ornaments. This kept her safe. She had a purpose again. A lot of the toys belonged to myself and my other cousins. Ma had gone on a holiday to Samoa for Christmas, and so my cousins and I thought it would be a good idea to take our old toys to the City Mission for the kids in need. When Ma returned, she was livid that we had given away our own toys. She said that they were her toys and they were her family. She didn't talk to me for weeks! She believed that divine intervention returned her monkeys back to her as you see in the film. PBS: Despite the humor throughout, there’s a sadness knowing that she’s alone and filling a void with her stuffed animals and other trinkets. What made you go in this direction rather than keeping the entire film light? NIKKI: It was a hard decision not to make a comedy for this film because Ma is a very funny person. My whole family's sense of humor and cheekiness comes from Ma. However, I thought that the issues of parent abandonment and empty nest syndrome were a more important story to tell. Drama is also my preferred genre for film. And I wanted to see Ma pushed as an actor. Comedy and anger are easier emotions to portray than hurt. Most people can resonate with this film's message of looking after our precious elderly who have given so much to us. The mission of Pacific Islanders in Communications is to support, advance, and develop Pacific Island media content and talent that results in a deeper understanding and appreciation of Pacific Island history, culture, and contemporary challenges. Established in Honolulu in 1991 as a national nonprofit media arts corporation, PIC is a member of the National Minority Consortia, which collectively addresses the needs for programming that reflects America's growing ethnic and cultural diversity. Primary funding for a PIC and the Consortia is provided through an annual from the Corporation for the Public Broadcasting.